Recapitulation. The bio-mechanics. - Sitting Safely? Lordosis occurs at two levels of the human spine, cervical and lumbar. The spinal joints subject to internal derangement are the 4th, 6th & 7th cervical and the 4th & 5th lumbar” (Cyriax JH. 1946). Both these spinal levels are where mobile segments meet a solid mass, the skull and the pelvis, and where mechanical spinal pathology mostly occurs (Harrison DD 1998)and differences are found when comparing LBP patients with healthy patients (Jackson RP, 1994). Approximately two-thirds of total lumbar lordosis occurs at the inferior two segments (L4-L5-S1) (Kamali, 2003). This configuration occurred as a result of hominins adopting an upright (orthograde) stance for efficient bipedalism (see pages on Paleo-anthropology). The wedge angle reduces any tendency for retropulsion of the disc contents. Retropulsion can lead to impingement on pain sensitive structures ( ) and protrusion and extrusion of disc contents. Retropulsion occurs on axial loading with joint flexion (See ‘Effects on sitting posture’). The wedge angle is reduced when the pelvis is tilted backwards which occurs with upright sitting. This adverse effect is augmented by reduction of the hip flexion angle (occurs with a seat parallel to the floor) and pelvic support set too high. A large wedge angle is protective and occurs in people with a low incidence of LBP and where there is no tendency for reversal of the angle (ie. to go to 0° or below). Retropulsion is corrected (reduced) in a reclined position or with hip extension (Smith 2006). Excessive extension (lordosis) transfers pressure to the posterior pain sensitive structures. 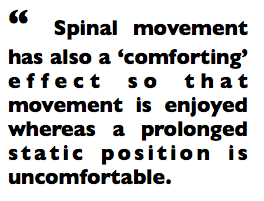 In moderation this is not evident clinically in the lumbar joints (but is in the cervical region). Movement to ensure intra-discal pressure changes is essential to provide dis nutrition (See ‘Disc nutrition’). Ligaments limit joint movement in a specific direction and provide stabilisation (See Anatomy/ligaments ). Ligaments are visco-elastic and can be lengthened by excessive, prolonged stretching. Excessive joint range and instability can lead to CTD (Solomonow 2003). Excessive joint range can disable the normal protective action of muscles (See Anatomy/muscles). Requirements for optimising the bio-mechanics of prolonged sitting. 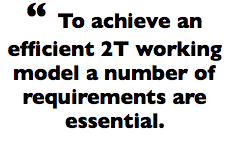 Combined these can be difficult to achieve, for office and home, but can be done using the 2 Tilt concept→. This entry was posted in Uncategorized on November 14, 2013 by Dr. Henry Sanford.